comes in - we’re spreading holiday cheer by helping people find the best online stores and shop with confidence. 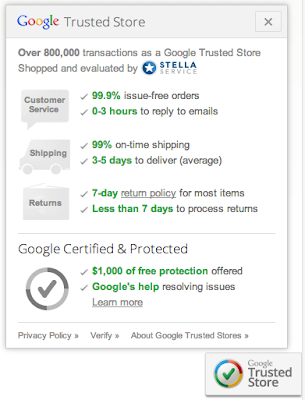 Google Trusted Stores is a free certification program to highlight retailers that offer a consistently great shopping experience. Qualifying merchants display a badge on their website, and Google stands behind these stores by offering $1,000 of free purchase protection. Since we introduced the program last year, we’ve been working hard to expand it, including launching a new integration with seller ratings on AdWords, updating the badge with more helpful information for shoppers, and broadening store participation around the world. Google Trusted Stores now helps to power seller ratings, which show on AdWords text ads as well as Product Listing Ads on Google Shopping. This integration provides shoppers with valuable information, while giving participating retailers a free and easy way to earn the ratings they deserve. Advertisers who display seller ratings on their ads typically see a boost in AdWords click-through rates, with higher ratings generally resulting in higher click-through rates. In the US, Google Trusted Stores now provides shoppers with an upgraded store performance summary that appears when they hover over the badge on a merchant’s website. The summary includes helpful returns, delivery, and customer support responsiveness metrics provided by StellaService, a company that objectively measures the customer service experience by shopping anonymously at online stores. Millions of people now see the Google Trusted Stores badge on retailer sites and in Google ads every day. In fact, we’ve more than tripled US store participation in the last year. Because shoppers value the badge, many of these stores are seeing sales growth. For instance, OnlineShoes measured a 4.2% sales increase from the Google Trusted Stores badge, and AutoAnything saw an increase of 5.2%. To learn more about the program, please visit our website. 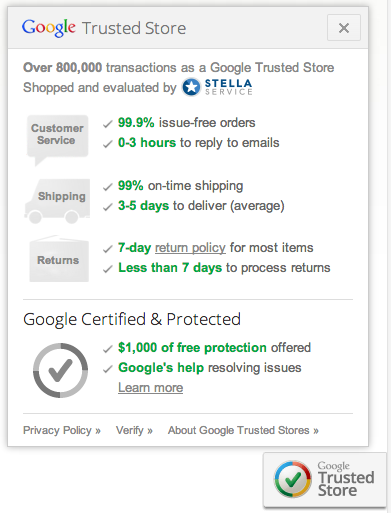 If you’re a US retailer, you can apply to become a Google Trusted Store. If you are a retailer outside the US, please let us know you’re interested here: UK, France, Germany, Australia. The holiday season is a time of the year when many of us spend hours finding the perfect gifts. It’s also a time when knowing that an online retailer is trustworthy is more important than ever. That’s where Google Trusted Stores comes in - we’re spreading holiday cheer by helping people find the best online stores and shop with confidence.